Siding Contractors Kansas City: Learn More About Our Siding Options! Siding is one of the most important components of your home, and it’s important to ensure that you’ve chosen the right style for your needs. 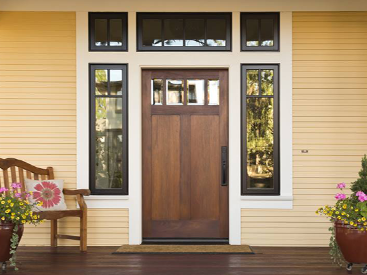 At Blue Springs Siding and Windows, we offer a number of home siding options that can help you protect your home while also increasing its overall value and curb appeal. Continue reading below to learn more about the siding we offer, and contact a member of Blue Springs Siding and Windows today to request a no-obligation estimate for your home! It’s no accident that vinyl siding is the most common siding option you’ll find in the United States. Vinyl siding was originally developed in the 1960s, and technological improvements have allowed manufacturers to further improve its best aspects. At Blue Springs Siding and Windows, we proudly provide our customers with Alside’s Prodigy vinyl siding. Prodigy is known for its efficiency-oriented design, and with foam insulation of up to 1.5 inches, you’ll likely see a decrease in your home’s energy use after the installation. This siding option is both extremely affordable and incredibly long-lasting, making it the ideal investment. The Kansas City weather can be harsh and unpredictable at times, but Alside’s Prodigy vinyl siding will stand strong through the hot days and cold nights we experience throughout the year. While vinyl siding is an attractive siding option, some homeowners are looking for a thicker and even more durable form of siding. 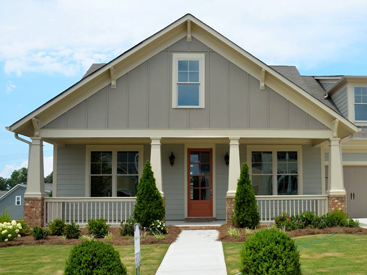 Fiber-cement siding has become popular in recent years, and James Hardie consistently sets the industry standard. Composed of cement and durable wood fibers, James Hardie siding is as tough as it gets. While older vinyl siding will sometimes crack and warp as it ages, James Hardie siding is up to five times thicker, making it an excellent investment for homeowners who plan on staying put for the foreseeable future. 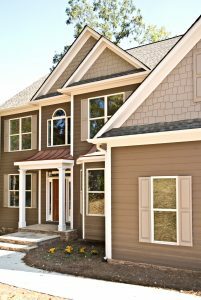 James Hardie siding is also noncombustible, and some insurance companies will even provide you with a discount for installing it on your home. As an added bonus, it’s been estimated that fiber-cement siding can return up to 79 percent of your initial investment! No matter which siding option is right for your circumstances, it’s important to ensure that you’ve chosen a color you’ll enjoy for the years to come. Blue Springs Siding and Windows proudly carries a wide range of color options that can accommodate virtually any aesthetic preference — you can view them on this page! Alside’s Prodigy vinyl siding is backed by a lifetime warranty, including protection against fading. No matter which color you choose, you can rest assured that your home will look fantastic! James Hardie’s color variance standards are more tightly controlled than paint used in the automotive industry, so you can shop with us knowing that your siding will look just like the samples in the store. We hope that this post will help you find the perfect siding option for your home. Keep an eye on our blog page for future posts in which we’ll continue to provide you with information about siding. 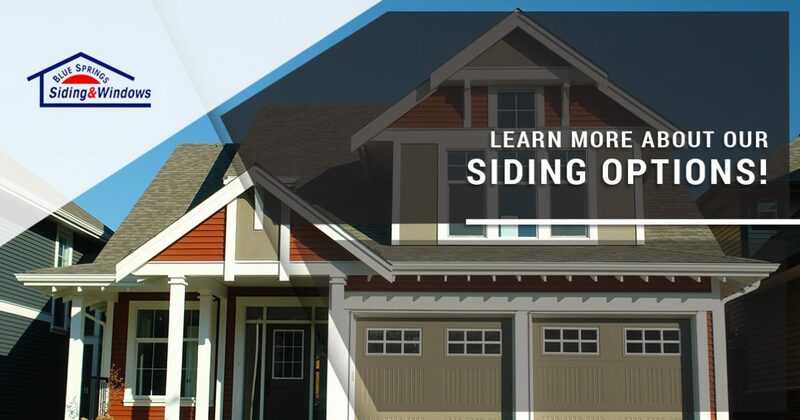 If you would like to learn more about our home siding options, or if you’re ready to get started on a siding installation, then get in touch with a member of Blue Springs Siding and Windows! Our friendly and knowledgeable staff will help you find the best siding for your home, and we’ll also work within any budgetary constraints you may have. 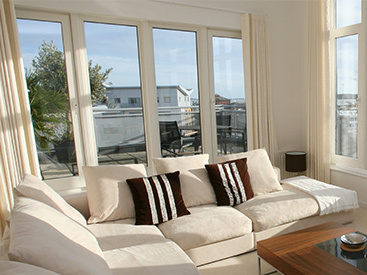 We offer lifetime warranties on all of our products and services, so don’t wait to give us a call! We look forward to speaking with you soon.